Gunmen shot six Christians dead including the pastor at a Midnight Mass Christmas celebration this morning. They then torched the church. “A group of gunmen came into the village at midnight and went straight to the church… they opened fire on them, killing the pastor and five worshippers. 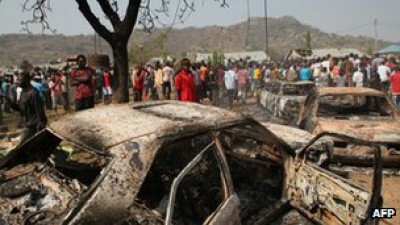 They then set fire to the church,” said Usman Mansir, resident of Peri village, near Potiskum, the economic capital of Yobe state.